Joan Spence, M.Ed., BA. 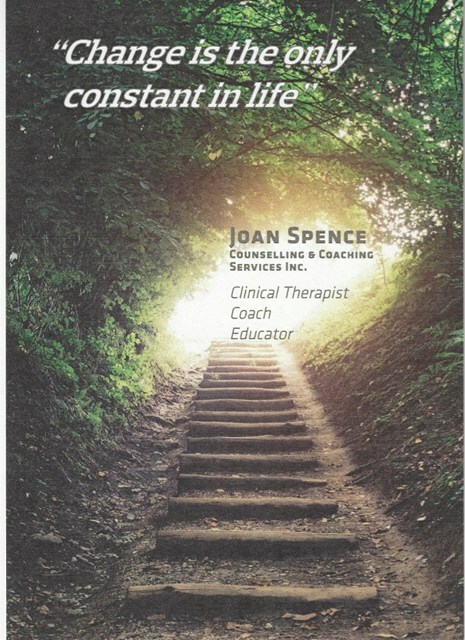 CYC Joan Spence is a Registered Clinical Therapist specializing in Life Transitions. When changes occur, such as getting married, having a baby, having your children struggle at school, going through a divorce, or a death in the family, she guides you through the journey using advanced training from the Gottman Institute, in the Satir Transformational Systems Therapy and Expressive Play Therapy (JIBC). It’s her sincere desire to foster healthy relationships within families, helping them navigate life’s inevitable chaos, providing the tools to grow and maintain open lines of communication, and raise children in an ever-changing environment. Utilizing the natural synergy between mind and body she connects clients to their inherent life force energy, allowing them to survive and thrive in challenging situations. Feeling overwhelmed? Together we will come up with a plan for your well-being when life's challenges have you feeling stuck. I use positive psychology and a client-centered approach, focused on your needs, with strategies to help you shift forward. "Change is the only constant in life"